Figs are very sweet to taste and also have a sweet aroma. They have leathery and wrinkled skin and are shaped like a bell. They may be white, black or red in color and are very nutritious. Fig is a natural laxative for your body as it is rich in antioxidants and fibers. Figs help to remove all the harmful toxins and waste from the body and prevent various skin problems like acne, psoriasis etc, providing you a healthy skin with a glow. The peels of figs also help in removing dead skin cells and provide you a smooth and blemish free skin. Many of the nutrients that are needed for a healthy skin, like vitamin C and B, potassium, phosphorous, magnesium calcium etc, are found in high quantities in figs. These keep the skin fresh and rejuvenated. Figs are also rich in omega 3 fatty acids, which conditions the skin from within and keep the skin moisturized. Figs are excellent moisturizers. Apply a paste of figs on your skin and this will make your skin supple and hydrated. If you have cracked lips, this paste will help healing it. The paste of figs prevents excess secretion of sebum and also helps in tightening the pores of the skin. Applying the paste of figs on your skin replenishes the skin from within. Take fresh figs and mix them well with 1 tablespoon of yogurt in a mixer and make a fine paste. Apply this on your face and gently massage your face for 15 minutes. Wash your face with lukewarm water. You will get a healthy and glowing skin. You can treat skin inflammations like boils and abscess by applying baked fig on your skin. It is also good for preventing pimples. If you have corns on your feet, apply the juice of fig on it and it will be healed. The paste of figs is also used as a scrub. For this you have to mix 2 tablespoons of fresh orange juice and 1 tablespoon of powdered sugar with the paste. Also add a few drops of olive oil. If you apply this on your face and body once in a week, you will get a soft and smooth skin. Figs contain enzymes that help remove dead cells from the skin and the sugar mildly polishes the skin, making the skin smooth and glowing. Vitamin C present in figs is good for getting an even toned skin. Make a paste of figs, dried ginger powder and powdered oatmeal and add a few drops of bergamot oil to the paste. Apply this pack on the face two times a week and you will see that you have an evenly toned skin within no time. Figs are also very effective for treating grey hair because it contains copper enzyme which helps to maintain the color of your hair. Figs are rich in many of the nutrients that are needed for having a healthy hair, like vitamin C, E, magnesium and so on. They help in increasing the blood circulation in the scalp and promote hair growth. The extracts taken from figs are excellent hair conditioners and keep the scalp moisturized. It is also good for detangling the hair. Fig oil provides you lustrous and shiny hair that is easy to manage. You can add the oil either to the hair mask you use or to your hair conditioner. This will provide you silky and smooth hair. Figs are very effective for curing acne. Mash fresh figs and apply this on your face. Let it remain on your face for 20 minutes and then wash with water. This will help you to get rid of acne. If you want to cure warts, apply the milky juice of fig leaves and the stem for several times a day. Do this every day till your skin is clear. Figs are also known for their anti-ageing properties. You can treat early stages of chicken pox with figs. Being rich in fibers, consuming figs helps in proper bowel movements and prevents constipation. Consume soaked figs with a teaspoon of honey every day. Take it in the morning and continue for a month. This will get you relief from constipation. Potassium is found in high quantities in figs and therefore they help in producing insulin, which is a hormone that helps in controlling the blood sugar in the body. Have fig seeds with a teaspoon of honey everyday and this will help you control diabetes. You will start getting positive results within one week. The leaves of figs are also good for controlling diabetes. The rich amount of calcium in figs provides you healthy bones if consumed regularly. If you are suffering from kidney stones, do not worry. You can easily get rid of the stones by consuming figs. 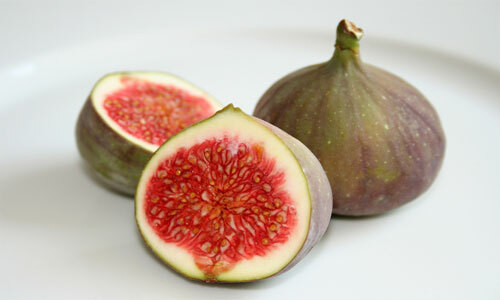 All you have to do is to boil six figs in a cup of water and consume it every day for one month. This will remove kidney stones and make you healthy. You get relief from ulcers in the mouth by chewing the tender leaves of figs. Just chew 2 or three leaves or gargle with the water to which these leaves are added. This is also good for getting rid of bad breath. Soak 4 or 5 leaves if fig in milk and keep it overnight. Have it in the morning and this will make you sexually active and overcome any weakness. Figs are good for treating sore throats also. Take water and mix dry figs and honey to it. This helps you get relief from sore throat. The dietary fibers in figs help you in losing weight. You mention figs for hair growth, but you do not offer a certain treatment or application of the fruit to the hair. Do you have any suggestions for treatment of the figs for hair loss? you have a lot of info about figs and what they are good for but you cant get more info on how to use them.